Lot Detail - The 14th Vermont Fires on Rebel Cavalry. The 14th Vermont Fires on Rebel Cavalry. 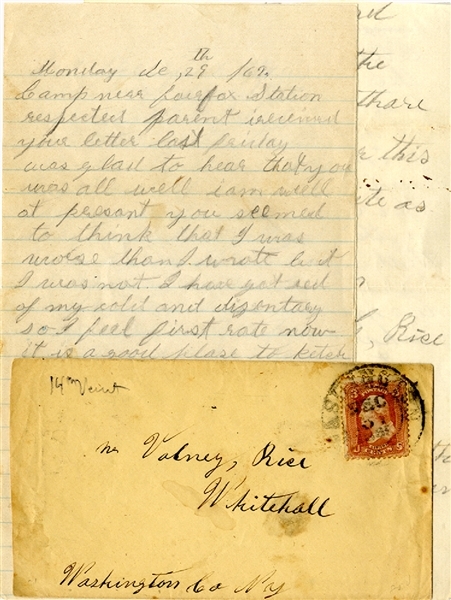 Union soldier's war-date letter, 5pp. 8vo., written by Pvt. Herbert C. Rice, Co. F, 14th Vermont, Vols., "Camp near Fairfax Station, Va., Dec. 29, 1862, in part: "…we had a little excitement here last night. We was ordered to get ready to march in light marching order. The regt. marched about two miles from here and was drawn up in line of battle and stayed all night. It was reported that there was quite a large force of rebel cavalry in sight of our lines…the 12th regiment fired a volley at them, killed one horse, but the rider they could not find as it was so dark…we have been on the move so much that it is not very hard to break up camp. I don't know whare we will go…the orders may be countermanded before morning…H. C. Rice." The original stamped transmittal cover is included. Overall VG.